I decided to go on this trip because I hadn't spent much time in that type of terrain and wanted to check out something new outdoor related. After going over several places we decided on Sedona, AZ. I had never been there and thought it would be a great place to experience especially since there are many things to outdoors. We planned mountain biking, a jeep trip and visiting the Grand Canyon. The acommondations weren't my main concern and I could easily camp, but we decided to stay at the L'Auberge de Sedona. Probably a little upscale from camping, but I was okay with that it. The first day we arrived in Pheonix, picked up the rental and drove north to Sedona exsperiencing the desert was really great but the final few miles is what put this trip in to perspective. Red rock mountains and beautiful landscapes. The rest of the day was spent exploring, checking in the hotel, and finding a good place to eat. We woke up early, had a great breakfast in the resort waited a few minutes for Pink Jeep Tours to pick us up. Yep they come to L-Arberge and pick up guests. I have to admit I was not really excited since it is a tour type event and after having several Jeeps, I thought going along as a passenger wouldn't compare. I was pleasantly surprised as my doubts faded because the landscape is so cool as Sedona surpasses everywhere I had jeeped before. Mud and small hills don't come close to steep red rock climbs, interesting terrain and all this only minutes from downtown. The proximity is great considering I would drive an hour finding a decent trail where I lived during the jeeping days. If you get a chance, either book a tour or rent a jeep and check it out. Maybe next time I may rent just to spend more personal time exploring and using my own instincts to guide the ride. Either way, it is a really great way to spend a day in Sedona. Highly recommended. The following day was spent mountain biking using rentals from $bike store. My first ride on a 29er and it convinced me to build one for myself. There are many trails to choose from close to town and the bike shop. No need to drive after renting a bike. Just ride to a close trail and check it out. We opted for a close trail and I can't complain. The ride took about 3-4 hours and we didn't even hit the numerous trails found around there. The ride didn't have a lot of elevation, rather was more cross country / all mountain ride. So many miles to explore. I could spend a year checking out the numerous trails and would ride those any day, any time. No regrets here. Day three was drive up to the Grand Canyon. I found the drive fun and really interesting because as you drive up in to some high altitude places, but find a large expanse flat plain as if there weren't any mountains around at all. The Grand was , well, the Grand Canyon. We decided to drive around the rim, take some photos, site see and end up at the castle where you can see large areas of the canyon. I really wanted to do a little more hiking as in hike to the bottom, but there was too much snow to actually climb down the trails which would have been slightly dangerous and probably impassable at least the trail I saw. Another reason to visit again. 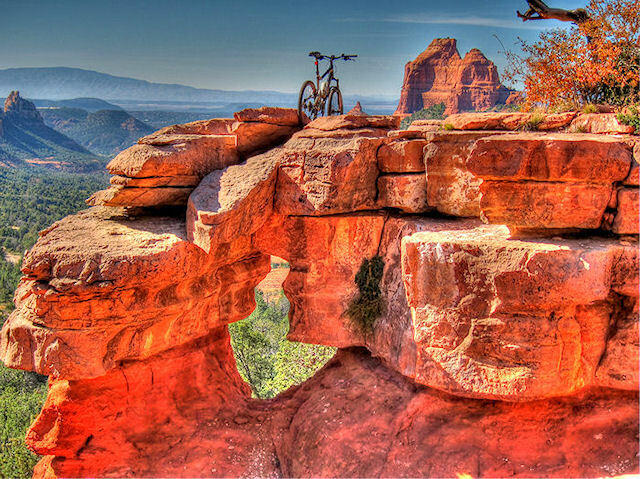 I would definably do Sedona visit to explore more of the mountain biking, more of the hiking and just more of everything but the next time, I would stay longer and head there during spring, early summer so we could check out more of the water sports, hike more of the Grand Canyon.